Gate.io occupies a niche space in the cryptocurrency market by operating a crypto-to-crypto exchange with a plethora of advanced trading functionality like margin lending and borrowing, yet it doesn’t integrate fiat money and doesn’t impose restrictive verification requirements on its users. Given this reality and its lack of regulation, Gate.io therefore offers higher risk and reward to cryptocurrency traders and has so since its founding in 2013. Stacked up against other exchanges, Gate.io isn’t near the top 10 and instead occupies number 33 according to CoinMarketCap with 24-hour volume of just over $65 million (as of November 27th, 2018). Amongst the community, Gate.io is widely known as a corner of the cryptocurrency market where altcoin enthusiasts gather to gain exposure to assets that aren’t available elsewhere. To open a Gate.io account, the first step is to type gate.io into your browser and check out the site. You’ll find a fairly basic layout with a login form situated on the top portion of the page. 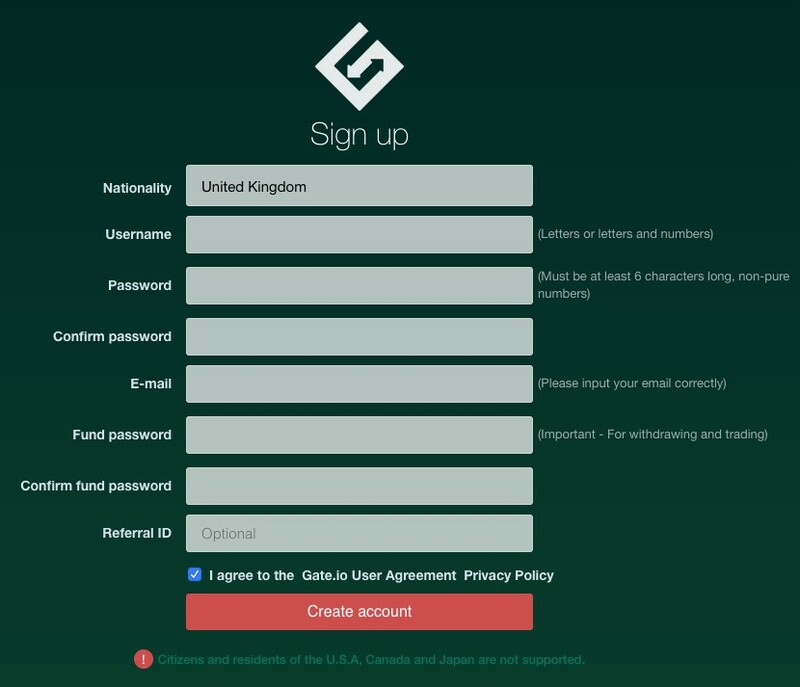 Click the Signup link at the bottom of the login form to be brought to Gate.io’s first-time user page, where you need to enter your full name, pick a username and password, give your email, pick another password for funding (a unique concept), and then click Create Account. You can also input to a friend’s referral ID to reward them for sending you the invite. Like some other exchanges such as Binance, Gate.io has a CAPTCHA system that has users slide a “puzzle piece” into place before being able to login. After passing the CAPTCHA, you’ll be sent an email with a confirmation link, to the account you signed up with. Click it to be redirected to Gate.io as a new user, where you’ll login again and view the dashboard, but this time with your own username and account stats occupying the space that was formerly the login form. Once you’ve confirmed your email and are able to login to Gate.io, you’ll notice that the bottom of the dashboard has two messages. One message says, “Please register real name before proceeding”, and the other says “You must enable one-time password (TOTP) or add your phone number”. Neither of these are true, as users can deposit cryptocurrency to their Gate.io wallets without 2FA or further verification. However, it’s important to secure your account when using any exchange. 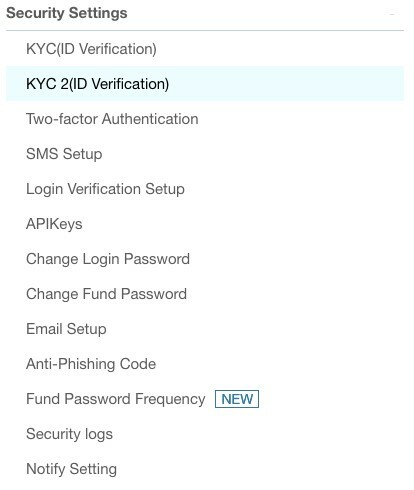 To set up 2FA, click on Wallets at the top of any Gate.io page. 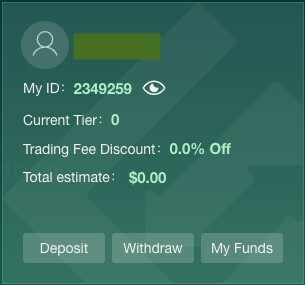 You can also click on the Deposit button in your dashboard’s user panel. The left side of the Wallets page provides all the account configuration options available to Gate.io users, including further account verification and 2FA settings. No matter if you’ve gone through advanced ID verification, set up 2FA, or handled neither of these aspects, depositing cryptocurrency is a straightforward process. It should be noted that for the tiered account system used by Gate.io, users don’t advance through verification but only through trade volume. Also, verification has no influence on one’s ability to deposit, their deposit limit (unlimited), nor their withdrawal limit ($100,000 daily). Click on the Wallets link at the top of the Gate.io page, or the Deposit link on the dashboard panel that displays your basic user information. You’ll see the Funds page that lists each wallet associated with the currencies listed on Gate.io. As a strictly crypto-to-crypto exchange, there is no fiat gateway, meaning that the only way to add funds is to click on Deposit next to the relevant cryptocurrency. Gate.io will redirect you to a page that generates a deposit address for each coin you wish to deposit. Copy this address and paste it into the wallet you’re withdrawing from, and then wait for the blockchain to confirm the transaction and send the coins to the Gate.io wallet. To buy any of the cryptocurrencies listed on Gate.io, one must use cryptocurrency already deposited to and held in the Gate.io exchange wallet. 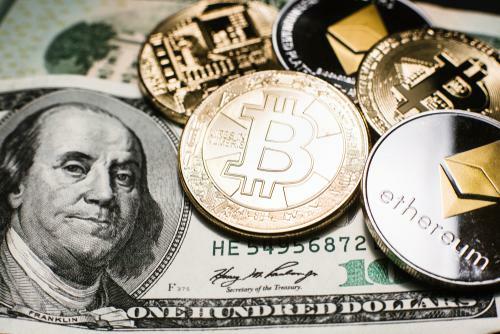 It’s simple to exchange one cryptocurrency for another, and when one wants to exit their position and move into cash-like equivalents, they can use Tether (USDT), TrueUSD (TUSD), or USDCoin (USDC)—all “stablecoin” cryptocurrencies that are pegged to the US dollar. 1. 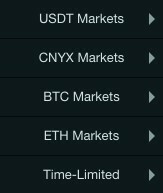 Go to the Markets tab on the top of any Gate.io page and select the relevant counter-currency you want to trade against. 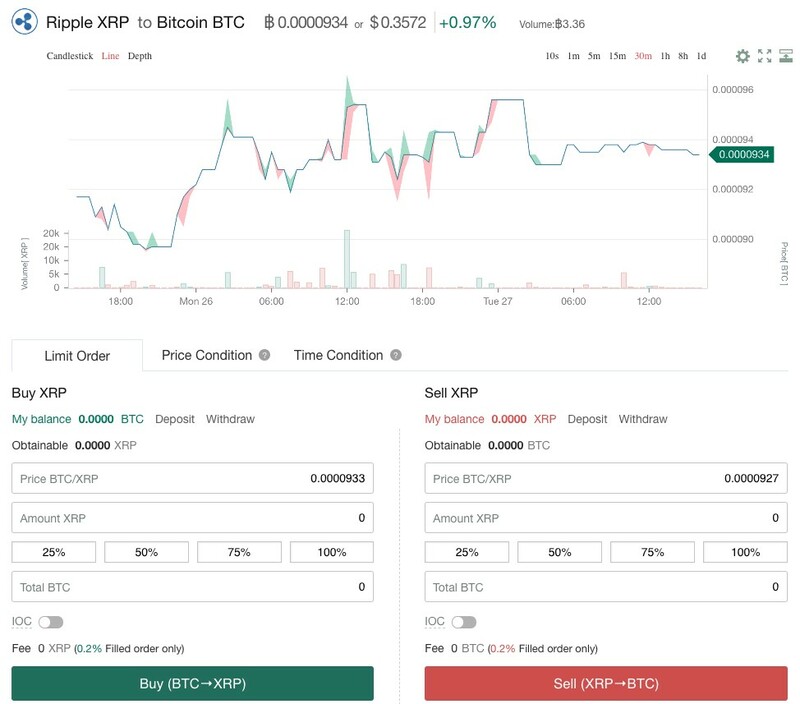 If you have Bitcoin (BTC) and want to buy Ripple (XRP), for example, you’d click on the XRP/BTC pair in the dropdown or type in ‘XRP’ into the search bar. 2. 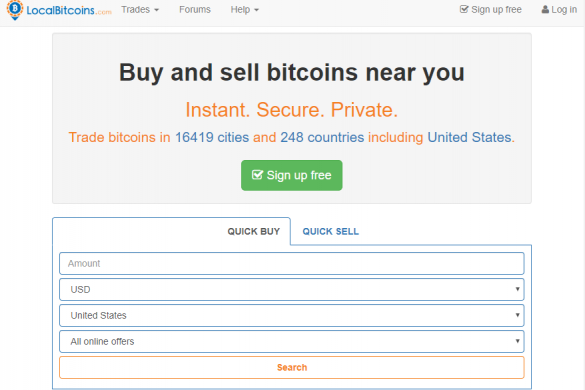 After clicking on the correct icon you’re directed to the Exchange page corresponding to the relevant cryptocurrency pair. 3. 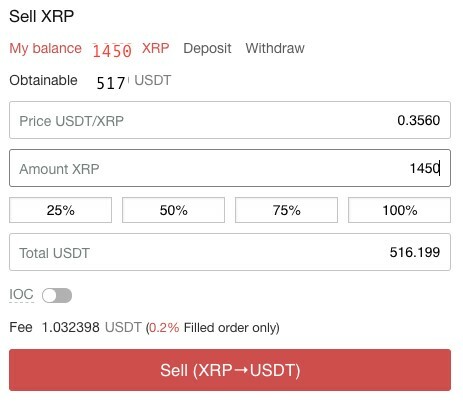 To create a limit order for XRP, you’ll first enter the amount of XRP you’d like and the price you’d like to buy it at in BTC. 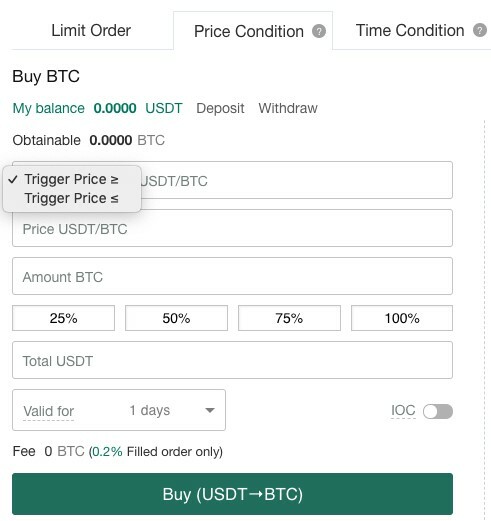 The tool will tell you the total cost in BTC (or your chosen counter-currency) that will be taken from your account once the order is filled. 4. Your new balance will be reflected in the appropriate wallet on your Wallets page. There is no fiat integration for the Gate IO exchange, so to exit a position or avoid volatility, you’ll instead sell your cryptocurrency for another or purchase one of the many stablecoins listed on the exchange. 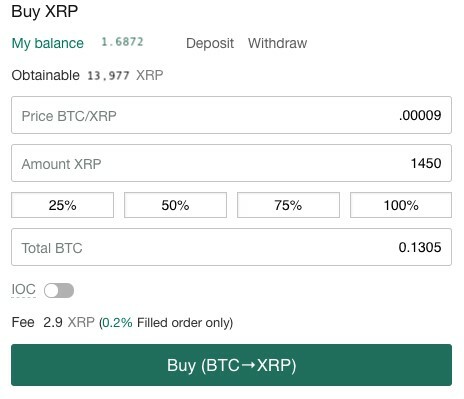 Selling your XRP for BTC requires the same steps listed in the previous section, but instead of selling BTC for XRP you’re buying BTC with XRP. 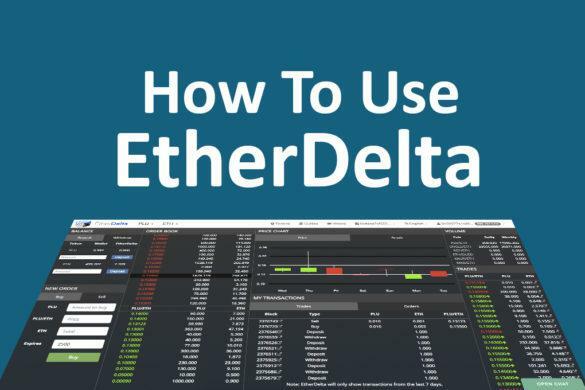 To instead sell your XRP for USDT, for example, you need to go to Markets and click on USDT Markets, then find XRP. Find the “Sell XRP” panel under the chart and create a limit order for USDT according to your preferences. With a peg to USD, the cryptocurrency you exchange for USDT will hold its relative fiat value regardless of what’s happening in the crypto market. 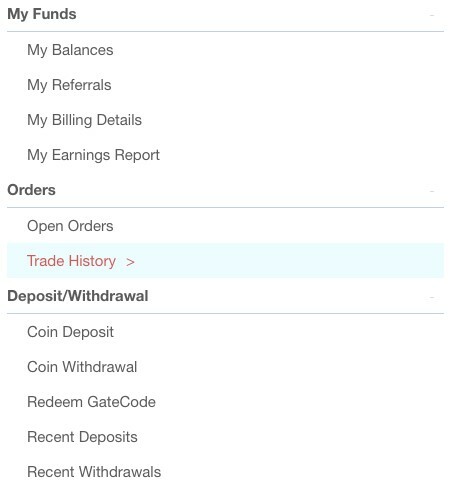 Withdrawing cryptocurrency from Gate.io is accomplished via the same Wallets page that you used to deposit. Click on the Wallets tab on the top of any Gate.io page. Find the wallet of the currency you want to withdraw by searching or scrolling. 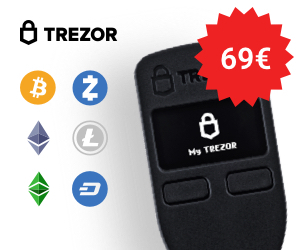 Click the Withdraw button next to the wallet. Instead of generating a deposit address, you’ll do this on the exchange or wallet you want use as a destination for your withdrawn funds. Paste that wallet’s address into the field that Gate.io presents to you, and then input your fund password. Click “Submit request” for the blockchain to begin processing your withdrawal. It will appear in the correct wallet shortly thereafter. Traders will find a thorough breakdown and visualization of their trade and order history on the Trade History page, which can be found on the left-hand side of the Wallets page alongside other Gate.io options. On this page you can view all the trades you’ve opened and closed on Gate.io or filter it by market (counter-currency) or coin, but also by date. For example, one can see their entire account’s history of trades or just their BTC trades made within a custom time period. 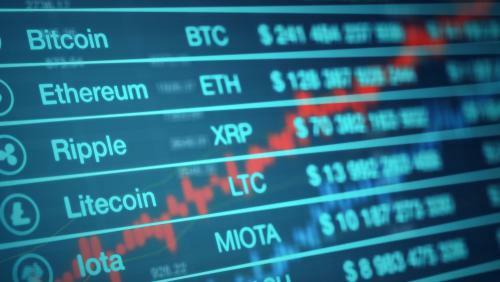 Wide Selection of Currencies: Besides listing a handful of stablecoins whereas most exchanges choose one or two, Gate.io also boasts an impressive selection of cryptocurrencies including the most popular such as Ethereum, Bitcoin, Qtum, EOS, and over 200 more. Many Trade Types: Limit orders are nice to have but Gate.io also has unique order types like Price Condition and Time Condition. Price condition allows once to set orders that execute based on an asset’s price and keep it open (“valid”) for a set number of days. Time condition allows you to set certain sized buys at regular intervals. No Fiat Integration: One cannot buy cryptocurrency with fiat currency via Gate.io (such as with a one-time bank wire or a credit card), nor can they deposit fiat into the exchange. Instead, those without cryptocurrency will need to find an exchange that allows them to buy crypto with fiat, and then transfer it to Gate.io once it’s been purchased. This also means that one cannot exit into fiat like they can elsewhere and will instead need to make use of stablecoins. Complicated Concepts for Beginners: Gate.io exhibits some functionalities that will confuse beginners, such as unique order types, margin trading, lending, and borrowing. It’s also unfortunate that traders cannot make market orders. While advanced trades empower veterans familiar with managing risk for greater flexibility and returns, they’re a threat to the uninitiated. Gate.io excels at delivering a comprehensive selection of cryptocurrencies and making them accessible to a wide trader audience. For an exchange that doesn’t require much verification (and is itself unregulated), Gate.io’s security tools and other trading features are advanced. Veterans will also appreciate the addition of margin for trading, lending, and borrowing as well as special order types that grant greater control over their trades. Overall, the exchange should appeal to traders with a higher risk appetite and demand for altcoin exposure.